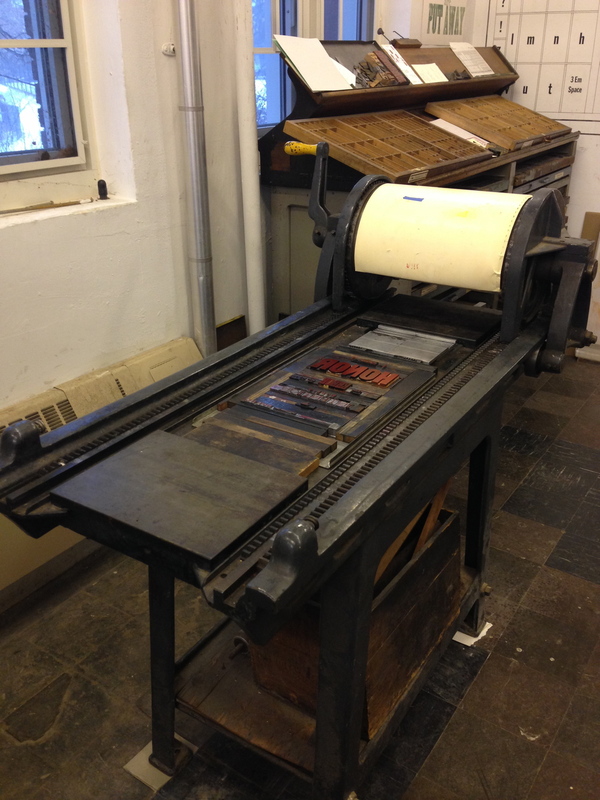 In January of 2014, I went up to Ithaca to visit Cornell University's fabulous Risley Letterpress. This marks the second year for me of going somewhere more icy and snowy and freezing than Brooklyn to do a letterpress marathon. Last year I went up to North Adams, MA to the Press Print Marathon, put on by the wonderful Melanie Mowinski. This year, I visited with Marcie Farwell and Jim Tyler, in Ithaca, NY to work on some gorgeous presses that Jim runs there. The proofing press I worked on. Marcie and Jim working on the Challenge press. I did a quote from Brian Eno that resonates with me. I love the sphynx! Some of the type Jim has is a hundred years old. I had a great time, and learned so much from Jim, who has been working in printing all his life. He has published some beautiful books of poetry through his publishing house, Larch Tree Press, all done there at the Risley Letterpress. Truly a special and deeply dedicated printer. Thanks Jim!